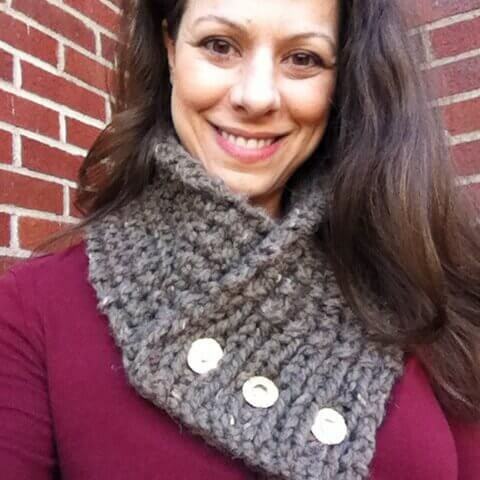 Last month I posted my Quick and Comfy Crochet Scarf Pattern for the Lion Brand #scarfie project. I absolutely love wearing it every chance I get and have had a great response from my readers as well. And I also received a bunch of requests from knitters to post a knit option as well. So back to the drawing board I went and worked up a knit version. This Quick and Comfy Knit Scarf Pattern looks so similar to the crochet version … just check put the photo above. 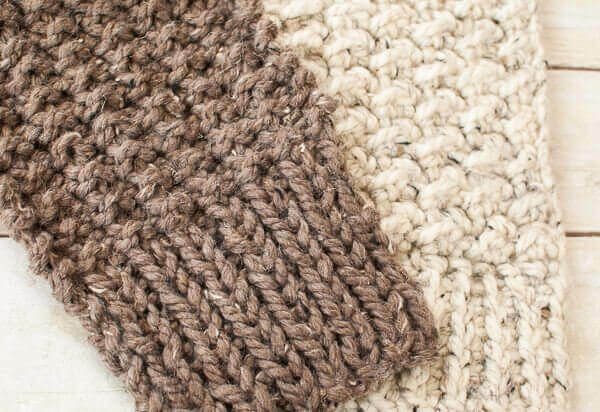 The knit version is the brown one on the left and the crochet version is the cream colored one on the right. Pretty close, right? And best of all, you can work up this knit version with just one ball of Lion Brand Wool Ease Thick & Quick! Row 1: *Knit 1, purl 1, rep from * across, knit last st — 15 sts. Row 2: *Purl 1, knit 1, rep from * across, purl last st — 15 sts. Rows 3 through 10: Repeat Rows 1 and 2. Row 11: *Knit 1, purl 1, rep from * across, knit last st — 15 sts. Row 1 (Wrong Side): Knit each st across — 15 sts. Row 2 (Right Side): *Knit 1, purl 1, rep from * across, knit last st — 15 sts. Rows 3 through 74: Repeat Rows 1 and 2 through Row 74 or for approximately 25 in. Row 75: Knit each st across — 15 sts. That’s it! Now you’re ready to wear. Just fasten with your favorite shawl pin or brooch or with a set of pretty pedestal buttons like shown here. And don’t forget to share your scarfie too! I would love to see it … post it up on Facebook, Twitter, or Instagram and be sure to tag me @petalstopicots and use the #scarfie hashtag so we can all find each other. I absolutely love this scarf. I can hardly wait to make it. This is exactly what I’ve been looking for. I praise your true creativeness. Keep up the greatness in which we enjoy. I just looked to see about the screw on buttons and you can’t get them in sets of 3 anymore and about the only ones you can get are the leather ones, boo hoo I’m going to use just reg. flower like buttons and hope it works, ty love this pattern. Love this pattern. I have a bunch of worsted yarn I would love to use up instead of bulky/chunky. How many should I cast on for this pattern if I used worsted weight yarn, maybe size 8 needles? I don’t know how to knit with needle so how can I make this on a loom? Hi wanting to make this for myself..what # is this wool u used….. I made mine in coral, love the pattern and button details, but my edges are curling inward. It kinda ruins the effect. Any ideas? Hi Laura 🙂 That is usually from either casting on or binding off too tightly. You can combat that ahead of time by using a slightly larger hook when casting on and binding off. If the project is already finished, many times blocking helps that. Hope this helps! Am I the only one who is finding that my scarf I’m knitting looks about 1/2 the size of the one in the picture? I know I have the right weight yarn and right size needles. It just looks so much broader in the picture than mine is turning out. It’s going to be beautiful either way, but was hoping for the look in the picture. Thanks! Individual gauge and yarn brand, even if in the same weight category can affect finished size quite a bit. I also always block my items larger so that may help you as well. Where do you get 160 yd. balls of Wool Ease? I have many left over balls of this yarn and I know all the women I knit for would love this, but the only balls I can get are 106 yds, and I would hate to run short because I don’t have the right size balls to make it. You are correct, it is 106 yds. It was a typo on my part. I fixed it now. Thanks! Love the Scarf. Was the golden string a separate ball from the bulky yarn? Hello 🙂 That is just how the yarn comes, no need to add anything additional. I just finished knitting this pattern and it looks so good! I added one stitch button holes on row 5 of the finish ribbing. 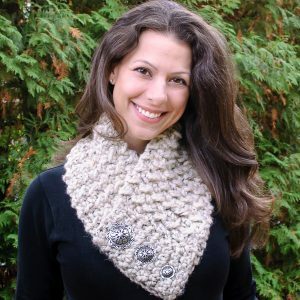 I have made two scarfs but can’t find pedestal buttons locally. Where did you buy your buttons? This pattern was so quick and easy and I don’t even knit. That’s how much fun it was. Thanks! I was wondering the same thing. Do you sew the buttons through and then lift it on and off over your head? Thank you so much for sharing the knitted version. I admired it when I first saw it and was disappointed when it was crocheted. I will definitely be starting this after Christmas! I used pedestal buttons that screw through the layers. You can also use a shawl pin. Do you sew the buttons through all of the layers? There are no “buttonholes” right? EXACTLY the pattern I’ve been looking for! Will start one tonight! 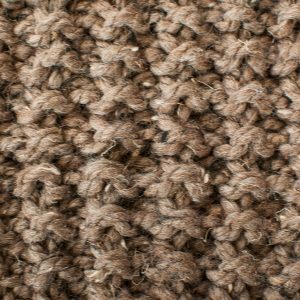 Great pattern -easy to follow- just finished mine in Oatmeal. Thanks.